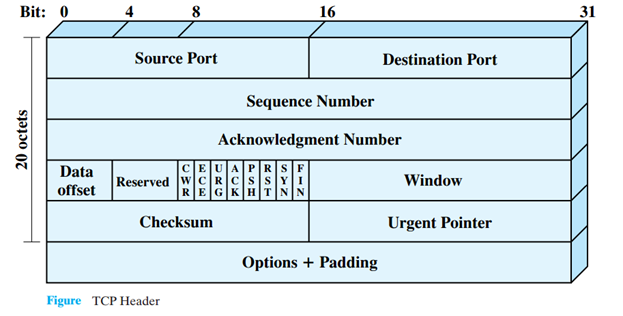 Source Port: It is 16 bits in length and defines port of the source TCP user. Like HTTP has 80 port number. Destination Port: It is also 16 bits in length and tells the port of the destination TCP user. Sequence Number: A 32 bit number which tells the sequence of the data in terms of octets. Contains the sequence number of the first data octet. Data Offset: Tells the quantity of 32 bit words in the header. It is 4 bits in length. Reserved: 4 bit number reserved for future use. Flags: These are 8 bits in length and have different meaning and control information. e.g. RST reset the connection. Window: It is 16 bits long and contains the number of data octets beginning with the one indicated in the acknowledgment field which the sender of this segment is willing to accept. Urgent Pointer: The urgent pointer points to the sequence number of the octet following the urgent data. It is 16 bits in length.